Naturalised a French citizen in 1948. A pioneer of lyrical abstraction with Hartung and Soulages, Schneider participated in 1946 in the first post-war exhibition of abstract art at the Galerie Denise René, Peintures abstraites, which included Dewasne, Deyrolle, Hartung and Marie Raymond, with a text by René de Solier. Despite his position as the oldest of these artists (he was already 50 years old and had begun to paint when he was no longer in his youth), he demonstrated a youthful spirit, which was to remain one of the characteristics of his work. Schneider attended the Collège de Neuchâtel, in which town his father was established as a cabinetmaker and antique dealer. In 1910 he worked with the painter Alfred Blailé and began studying decoration. In 1916 he was admitted to the École des Arts Décoratifs in Paris, where he was encouraged by his teachers, who included Paul Renouard. In 1918 he was admitted to Cormon’s studio at the Beaux-Arts. Schneider paid frequent visits to the Musée du Luxembourg to look at the works of modern art. In 1922, after a visit to Venice and a brief return to Neuchâtel, where in 1920 he had an exhibition, Schneider settled permanently in Paris. Until 1926 he earned a living as a picture restorer (which explains his impeccable technical mastery) and decorator. In that year, however, he showed for the first time at the Salon d’Automne with L’allée hyppique. This marked the conclusion of a post-impressionist period, “convinced of the error of the atmospheric effects and of the principle of the illusion of bodies in space,” he wrote in Revue du Vrai et du Beau (1926). A period of research into movement commenced during the years 1926 to 1931, followed by works derived from the imagination that investigated expression and construction (1930–1939), as well as a number of imaginary landscapes. In 1932 Schneider began to paint non-figurative works, although on several occasions he still reverted to figuration. In 1936 he showed five works at the Salon des Surindépendants, including Figures dans un jardin, in which the body appears as no more than a sign. The critic of the Revue moderne saw in this “a style” and “the expression of movement included in the rapid stroke”. Schneider participated again in the Surindépendants in 1937 with Rencontre, in 1938 with three works titled Composition and a final time in 1945. In 1937 Schneider ceased painting from nature. His palette began to darken, demonstrating a preference for black. Between the wars, the artist went through a period of intense investigation, stimulated by the artistic milieu he frequented, with its satisfying intellectual climate. A familiar figure in the Paris musical world from 1926 onwards and a contributor to surrealist thought in the period around 1937, he met Paul Eluard, G. Hugnet, O. Dominguez and Luis Fernandez. He wrote his first poems Mots au vol, published in 1974 by Jean Orizet. He studied the main currents of contemporary art, refusing any indoctrination in order to preserve his independence. “I wanted to see the result of each search… so as to survive,” he told Michel Ragon (Cimaise, April 1956). When war broke out in 1939, he was not required by the French army, despite his wish to enlist, and he remained in Paris where he met Picasso. Between 1941 and 1943 he took part in Gurdjieff’s teaching. After a transitional period lasting from 1939 to 1943 and which tended to be non-figurative, Schneider finally committed to abstraction. Its invented forms made no reference to nature, and did not give in to the temptation of geometrics. In 1945 the Paris Musée National d’Art Moderne made a first acquisition from him: Composition, painted the previous year. This work was reproduced in the first post-war issue of Christian Zervos’s Cahiers d’Art, with La cité of 1939. From 1945 all Schneider’s works carried the same title: Opus, to which he added a number. The similarities that his painting with its pronounced lyricism presented with music should be mentioned here. A description of Schneider’s work calls for terms employed by the music critic: ‘improvisation’, ‘giving the tone’, ‘striking cords’ and above all: “That dated term ‘inspiration’… the only one which allows me to express what my painting is based on” (op. cit. Michel Ragon), used to express the intensity of his passion. Although he admitted to a parallel between his painting and music (he particularly admired Bach, Beethoven and Mozart in addition to Wagner and Schönberg: “very close to what we are doing”), he denied attempting to achieve any form of musical effect. In 1946 he exhibited with Hartung, Deyrolle, Dewasne and Marie Raymond at the Centre de Recherches that Domela had recently founded in rue Cujas. Charles Estienne, to whom he had been introduced, organised the exhibition D’un art abstrait, accompanied by a collection of lithographs for which he wrote a preface (Opéra) and which included Del Marle, Engel Pak, Fleischmann, Miesztrik de Monda, Poliakoff and Warb. He participated in the first Salon des Réalités Nouvelles, where he showed until 1949, and then from 1956 to 1958. He took part in a group exhibition at the Galerie Denise René in 1947, Peintures abstraites, with Magnelli, Dias, Duthoo, H. Nouveau, Piaubert, Poliakoff, Pouget, Reth, Vasarely, Dewasne, Deyrolle, Hartung and Raymond. In the spring of 1947 his first solo exhibition was held at the Galerie Lydia Conti where, with Madeleine Rousseau’s backing, Schneider succeeded his friend Hartung: 13 works were hung including Opus 316. In December, there was a second exhibition with gouaches made during one of several stays at Gordes. Charles Estienne wrote of Schneider’s “simple but generous style which says everything” (Combat, 27 December 1947, De tout un peu). Gordes had been ‘discovered’ by Deyrolle, O. Le Corneur and Dewasne, and this village in the Vaucluse hills, which up until then had been frequented by André Lhote and his pupils painting from the motif, now became invested by the ‘abstracts’. Schneider and his wife were joined by Odile and Léon Degand and friends from the Galerie Denise René: Charles Estienne, Jacobsen, Gilioli, Poliakoff and Vasarely. Until 1949 he worked on large flat surfaces, painted with glue in organised constructions, which led to the principles of monumental painting but which, however, did not come to anything from a lack of orders. He had a further exhibition in 1948 and Charles Estienne wrote an article, Art brut et art tout court, which appeared in Combat on 25 February. In 1950 he presented his final exhibition with Lydia Conti before joining the Galerie Louis Carré where, in 1951, he showed with Hartung and Lanskoy. From 1947 Schneider participated in an increasing number of international group events that contributed to the growing reputation of his work. At the Galerie Denise René he took part in Sculptures et peintures contemporaines and, in 1948, in Tendances de l’art abstrait, as well as Quelques aspects de la peinture présente shown by the gallery in Denmark in 1949, and Quelques aspects de l’art d’aujourd’hui and Espaces nouveaux in 1950. In Paris, he participated in the events of the young abstract artists. In 1948 in Prise de terre at the Galerie Breteau with Atlan, Bott, Boumeester, Bucaille, Daussy, S. Durand, Gœtz, Halpern, Hartung, Labisse, Lapicque, Passeron, M. Raymond and Soulages. At the Galerie Colette Allendy Peintures et sculptures abstraites in 1949, and From One Season to Another in 1950. Charles Estienne invited him to be part of the 1st group for La Nouvelle École de Paris at the Galerie de Babylone in 1952, and equally, in 1953, to participate in a cycle of solo exhibitions titled Introduction à la Nouvelle Ecole de Paris at the Galerie Ex-Libris in Brussels. The same year, on 9 June, he took part in a public discussion, A propos du premier bilan de l’Art actuel at the salle de Géographie on boulevard Saint-Germain. In 1954 R. Van Gindertaël, who defended his work, included him in Divergences-Nouvelle Situation at the Galerie Arnaud. 1955 Éloge du petit format at the Galerie La Roue, an exhibition organised by Michel Ragon, who wrote a preface for it and who, in 1956, presented L’aventure de l’Art abstrait at the Galerie Arnaud. In the same year Michel Ragon wrote Trompe-l’œil (Albin Michel), a novel in which Schneider appears under his real name with Atlan, Poliakoff and Soulages… Again with Ragon, he participated in Expression – Non-Figuration at the Galerie Le Gendre, and in 50 ans de peinture abstraite by Michel Seuphor, on the occasion of the publication of his Dictionnaire de la Peinture abstraite, at the Galerie Creuze-Balzac. 1947 Le Nouvel Art français, Musée du Luxembourg. In 1948 he was part of the French selection for the Venice Biennial and, in the same year, took part in the travelling exhibition Französische abstrakte Malerei, which toured German museums. In 1949 The new contemporary art, Kunsthalle, Bern; From figurative to abstract Museums of Modern Art, São Paulo and Buenos Aires; Painted in 1949, European and American Painters, Betty Parsons Gallery, New York. From 1949 he showed regularly at the Salon de Mai, for which he remained a member of the Committee until 1956. In 1950 he organised the Salon’s exhibition in Japan, sponsored by the Mainichi newspaper group (with the painter Oguiss serving as liaison). 1950 travelling exhibition Junge französische Maler stellen aus in Germany; Französisches Kunstschaffen aus 10 Jahren 1940–1950, Institut Français, Innsbruck; 1950–1951; Exhibition of contemporary French art, travelling exhibition Japan; De Manet à nos jours, Musée de Lyon and Latin American capitals; Französische Malerei und Plastik 1938–1948, Maison de France, Berlin; Rythmes et couleurs, Galerie Bernheim Jeune, Paris. 1951 École de Paris 1900–1950, Royal Academy, London (organised by the British Council); École de Paris, Knokke-le-Zoote, Antwerp; 1951–1952 the Galerie Louis Carré organised in several museums in the USA the exhibition Advancing French Art; the Phillips Gallery bought one of his paintings. 1952 Painters of today France-Italy, Turin; Malerei in Paris heute, Kunsthaus, Zurich; Berliner Neue Gruppe mit französischen Gästen, Berlin; The École de Paris today, Ostend; Exposition d’Art contemporain, Aix, Cannes, Toulouse. 1953 International Art Exhibition, Japan, and in 1955, 1956, 1957, 1959; received the Governor’s Prize, 1961, 1963 and 1965. 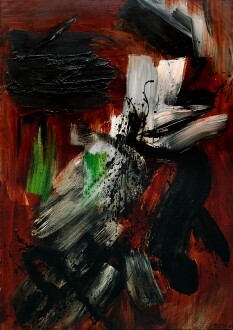 1954 Internationale Sezession, Leverkusen; Les grandes étapes de l’Art moderne, Musée de Rouen; Current trends in French art, Ostend; Philippe Dotremont Collection, Stedelijk Museum, Amsterdam; Graindorge Collection, Kunsthalle, Basel. 1955 International exhibition of painting, Valencia (Venezuela) and Caracas, followed by Spain. 1956 École de Paris, Palais des Beaux-Arts, Lille; Expressionism 1900–1955, Walker Art Center, Minneapolis. 1957 La Peinture abstraite, Musée de Neuchâtel. 1958 Carnegie International, Pittsburgh; L’Art du XXIe siècle, Palais des Expositions, Charleroi; La Peinture, de Cézanne à nos jours, Pavillon de la France, Exposition Universelle, Brussels; Depuis l’impressionnisme, Musée National d’Art Moderne, Paris; École de Paris, Museums of Zagreb and Belgrade. 1958–1959 Französische Malerei der Gegenwart, Mannheim. 1959 De Gauguin à nos jours, Museums of Warsaw and Cracow; École de Paris 1959, Walker Art Center, Minneapolis, catalogue Friedman Martin; L’École de Paris dans les collections belges, Musée National d’Art Moderne, Paris; Peintres d’aujourd’hui, Musée de Grenoble; Collection Gildas Fardel, Musée Nantes. 1960 French painters of today, travelling exhibition in the museums of Israel; Fransk konst av i dag, Museum of Göteborg. 1962 École de Paris, Tate Gallery, London; École de Paris, Museums of Warsaw and Cracow: Contemporary Painters of the École de Paris, Morocco. 1963 Abstraction lyrique et abstraction construite, Musée d’Art Moderne, Brussels; Maler aus Paris, Orangerie, Munich. 1965 Contemporary French Art in Finland, followed by Czechoslovakia, Hungary and Roumania; Biennale de Menton. Turin Biennial 1951 and 1953. Venice Biennial in 1954 with three large paintings and again in 1964. A room in the French Pavilion in 1966, catalogue J. Lassaigne. 1955 Documenta I Kassel and II in 1959. São Paulo Biennial in 1951, 1953 and 1961, when a room was devoted to his work. Participated in the Prix Lissone in 1955 and 1957 when he was awarded the Grand Prix d’Art abstrait. Invited regularly to participate in L’École de Paris, Galerie Charpentier from 1954 to 1958, and in 1960 and 1963. Many exhibitions have followed since (complete list in the retrospective catalogue of the Musée de Dunkerque 1983). Schneider had few solo exhibitions in Paris. In 1951 at the Galerie de Beaune, 1954 at the Galerie Galanis, 1959 at the Galerie du Musée de Poche, 1961 at the Galerie Arditi, catalogue Schneider retrouvé by R.V. Gindertaël, 1962 at the Galerie Kriegel (gouaches), 1965 at the Galerie Arnaud, as well as in 1967, 1968 and 1970. Abroad, he had three exhibitions in Germany in 1952. 1953 Palais des Beaux-Arts Brussels, catalogue text by Robert Vrinat. A contract with the Kootz Gallery in New York from 1955, with exhibitions in 1956, 1957, 1958; catalogue text by Marcel Brion, 1959 and 1961. Marcel Brion wrote a text for the exhibition at the Galerie Der Spiegel in Cologne in 1957 (Schneider had shown there in 1952 and 1953). Exhibited in Tokyo and Osaka in I960. New contract from 1961 with the Galleria Lorenzelli in Milan (catalogue text by Giuseppe Marchiori). 1961 exhibited his gouaches at the Galerie Im Erker, Saint-Gall, catalogue text by Denys Chevalier. 1962 first retrospective of 120 paintings at the Kunstverein in Dusseldorf, then at the Palais des Beaux-Arts in Brussels, with an important catalogue and texts by Marcel Brion and R. Van Gindertaël. Unlike the abstraction of Kandinsky, Vasarely or Mondrian, Schneider’s abstraction was romantic and emotive. As he confided to R. Van Gindertaël in 1951: “An infinite variety of expressive and coordinated forms painted in two dimensions without background or superposition and of which the whole ‘occupies the wall’ as a total creation of forms and colours for a more expressive and more human content” (Art d’aujourd’hui, June 1951). Working with colour (gouache and pastel), he did not recognise automatism because, although “expression is an inner need, the conscious brings it its plastic structure”. This led him to define abstract art as the “consecration of our emotional world”. He continued: “We have to abandon the need for any form of identification with a figurative relationship, which would entirely distort or misrepresent the character of abstract expression… It is the world of emotions which is expressed by an appropriate technique. The spectator is free to interpret according to his feelings… in the same way he might react to a sonata” (Schneider, La liberté du geste, Michel Ragon, Arts, 15 November 1961). He would return to the same subject or work on several at the same time. Reinventing each time, a characteristic which led Marcel Brion to evoke Jacob’s combat with the angel, he worked in an explosion of forms and colours. In a constant dramatic tension, “planes and colours identify with spatial notions,” wrote Herta Wescher in Cimaise January–February 1955, going on to remark on the appearance of a phase with a “dispersion of elements that give place to an emptiness which acts as a centre of energy”. He gave preference to form over colour. With a palette in which prevail bright yellow, violet, red, green, black and brilliant white, Schneider’s painting is characterised by violence and constant animation. Passionate brush strokes attempt to capture the fleeting instant, liberating the mysterious forces that inhabit the artist and exalting chromatics served by a rich dense impasto that gleams like emeralds. Schneider had perfect mastery of all the techniques that he practised: watercolour, pastel, Indian ink and oil paint diluted with turpentine. He worked simultaneously on oil paintings and works on paper, granting both media equal importance. In his paintings on paper he achieved a personal style with a specific mixture of techniques. From 1947 onwards he combined Indian ink, gouache and pastels. He was particularly interested in the graphic quality of his work, to the extent that he lined forms in black, a colour which he was one of the first to use with such emphasis. Until 1965 he made small drawings in Indian ink against coloured backgrounds. The bright colours which predominated led him to acrylics. After 1975 his more complex compositions have transparent backgrounds. In 1979 he reintroduced black. His last works were gouaches in bright colours. For many years Schneider had worked in his converted farmhouse at Bouligny-sur-Essonne, not far from the Forest of Fontainebleau. He was awarded the Grand Prix National des Arts in 1975. Eugène Ionesco. Then at the Palais des Expositions de Montreuil. 1983 Rétrospective. Musée d’Art et d’Histoire de Neuchâtel, followed by the Musée d’Art Contemporain Dunkerque. Catalogue by Jean-Marie Dunoyer. Biography, bibliography. 1975 exhibited at the Galerie Beaubourg, Paris, with which he signed a contract. Catalogue Georges Boudaille; Gouaches at the Galerie Verbeke and in 1977. He showed at the Salon d’Automne from 1969. Tribute in 1979 (catalogue by Michel Ragon). 1986 Œuvres récentes. Galerie Trigano, Paris. 1990 Œuvres sur papier. Galerie Heyram-Mabel Semmler. Catalogue by Michel Ragon. 1990 Schneider. Les Années cinquante. Musée Pierre Von Allmen. Closel Bourbon Thielle-Wavre. Catalogue, text by Georges Boudaille. Museums: Paris Musée National d’Art Moderne, Ministère des Postes et Télécommunications (wall mosaic) – Dunkerque – Nantes – Grenoble – Strasbourg – Toulouse – Cologne – Brussels – Liège – Verviers – Neuchâtel – Zurich – Oslo – Montreal – New York – Minneapolis – Los Angeles – Rio de Janeiro – Djakarta – Milan – Rome – Turin – Kamakura – Cuauhtémoc. Gérard Schneider wrote a number of texts about painting, including Pour ou contre l’art abstrait, Arts, 10 December 1948. Marcel Pobé: Schneider, Le Musée de Poche, G. Fall, Paris, 1959. Michel Ragon: Schneider, Amriswil (Switzerland) 1961. Roger Van Gindertaël: Schneider, text by Marcel Brion. Alfieri, Venice, 1967.